Home » Personal Finance » 4 Brilliant Tips From "Smart Mom, Rich Mom"
It's hard enough to save money and focus on building personal wealth when you're single and building your career. But while also raising a family? Forget it. It feels almost impossible. Your kids need to be clothed, fed, cared for, educated, socially stimulated, and financially supported, over and over again until the day they move out of the house and can live on their own. And all of those needs require money in order to be met. Oh, and also? You have needs, too. It's easy to toss those aside, but they are equally as important. It's overwhelming! However, you can create a deep and cozy financial cushion while raising your little ones. Personal finance expert Kimberly Palmer knows this feeling all too well. 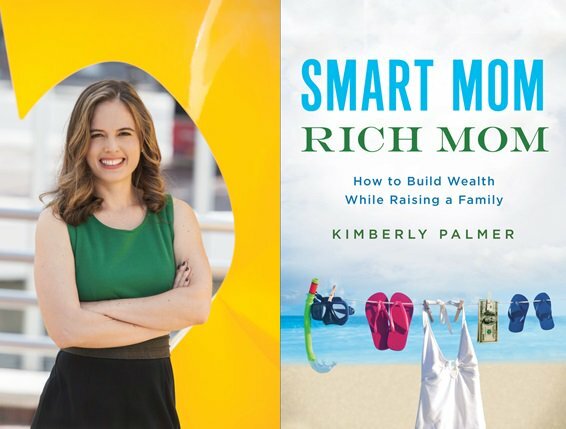 And in her new book, Smart Mom, Rich Mom, she examines the outdated misconception that women can't become savvy investors while also raising a family. Here are four of her most brilliant tips. Women have much more financial responsibility — and power — than they know. And that trend is increasing. By 2020, women will control two-thirds of the country's wealth, and 90% of us will handle our finances completely on our own at some point in our lives, due to death or divorce, according to Fidelity. In four out of 10 households with children, moms are the only or primary breadwinners, according to the Pew Research Center. Yet, according to a report from Boston Consulting Group, most women are unhappy with the level of service from their financial services providers, and many feel as if they are "talked down to" by male advisers. Clearly, the industry has yet to recognize that our lack of male reproductive parts in no way inhibits our ability to be our household's money boss. And in fact, a lot of us are pretty good at it. So don't ever second-guess your power as a financially savvy investor. Don't ever allow your adviser or anyone else make you feel like a clueless housewife. In chapter one, "Save (and Spend) Like a Mother," Palmer notes how the Great Recession made saving money cool again. It's no longer embarrassing to shop generics or clip coupons, because why should anyone spend more than they need to? But the practice of penny pinching and coupon clipping are methods of short-term saving, and because they can become time-consuming habits, they can lead to short-term financial planning, too. Not that we should nix the couponing altogether, but we need to leave room to focus on the bigger picture. Palmer suggests finding ways to save more on the grand scheme of things, like with a flex-spending account for childcare, or negotiating monthly bills to put that extra money into your savings account. In a perfect comparison, Palmer encourages becoming more of a "skilled shopper" and not just a "discount chaser." In chapter four, "Like a Boss," Palmer describes how exhausted she felt after the birth of her first child, and how that exhaustion led to concerns about not being able to contribute financially to the household while on maternity leave. Such a painfully relatable concern, I just wanted to leap onto the page and hug this woman for acknowledging it. You spend your early life building your career, becoming self-sufficient, and then you spend nine months growing a human in your middle, only to be left feeling rundown and dependent on your partner, in every possible way, during those first months of motherhood. Of course, as we all do, Palmer made it through the tough transition. And she did so by keeping that flame of ambition burning. She took on freelance work; she used her child's naptime as time to grow her Etsy shop. She had a moment of clarity early on that motivated her to create her own income stream, and ultimately ensure that her new baby would be given the best care, and the best life possible. So when those moments come, latch on and find ways to be your own boss. In chapter five, "Investing Mamas," Palmer talks about the importance of learning to manage your finances your own, as early on as possible. "We are going to be on our own at some point,"she writes," whether through choice, tragedy, or the simple fact that wives tend to outlive their husbands. That’s why we need to know how to manage our investments with the same confidence we apply to paying bills or planning the week’s meals." So while it's helpful for spouses to split household duties down the middle to make life easier, there shouldn't be a task that your partner does that you have no idea how to do, especially when it comes to managing money. Not only are Palmer's tips insightful and relatable, but she also provides clear, actionable steps at the end of each chapter to help you become the financially savvy, and independent woman you want to be. The book ends with a 12-month guide to creating a year of financial growth and brilliant organization so that in just a year's time, you can go from a stressed, overworked mama, to confident, money-savvy mom boss. Palmer is in your corner, and she's rooting for you to succeed. Feeling inspired yet? Pick up your copy of Smart Mom, Rich Mom, on sale today!